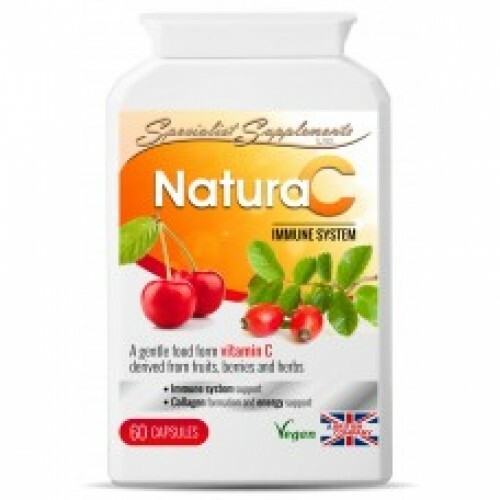 NaturaC is a full spectrum, (sometimes referred to as complex vtamin C), food state supplement which is derived from some of the richest sources of this important vitamin and antioxidant: Acerola Cherries, Rosehips, Blackcurrants, Parsley Leaf and Elderberries. Natural food ingredients are easily recognised by the body and therefore facilitate maximum digestion, absorption and utilisation. The vitamin C is then retained for longer and not rapidly eliminated. Loaded with Antioxidants, Vitamins, Minerals, Bioflavonoids, Pectins, Essential oils, Lycopene, Carotenoids, Plant Sterols, Catechins, Polyphenolics and many other Phyto-nutrients, this Vitamin C supplement is gentle and non-acidic. No artificial vitamin C (ascorbic acid).